A category, can be set up if events for that category are to be approved and/or marked for todo. If You are creating an event with a category marked for approval, this event will not be visible for other than the eventowner and Admins. When same category are also marked for "no overlap allowed" the event will, even if it cannot be seen, block for other events with same category ( reservation ) in the same timeslot. When an event then are approved by an admin, it will be locked, and now it is visible for others than the eventowner and admin. The eventowner cannot edit the event - only the admin can do that. The eventowner however, are able to "check" the todo box. Here You see an event created by Schwartz that has "own" rights. Here You see the same event. 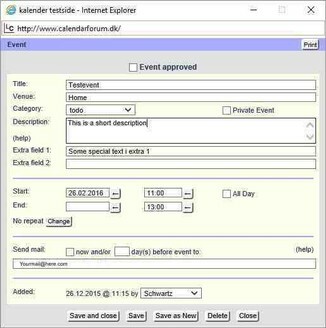 Eventowner is still Schwartz, but the user editing the event is now a user with admin-rights. Notice the approve box in the top. You have set the system up, so users/clients can book times in Your calendar. At first the bookings are pre-bookings. The time are reserved, but the event/booking has to be confirmed by You ( admin ). You confirm/approve the booking and it is now locked for others than the admin. This way the user makes a final accept, and the booking are now completely locked. By this method both You and Your client has accepted the booking. All You have to do, is to see if any bookings need approval. You can be automatically informed of this by the system. On the admin's Categories page, when adding/editing an event category, if you select "Check mark" and specify a label and a check mark, events in this category will have a check mark displayed just in front of the event title in the various views. For the owner of the event and users with "manager" rights this check mark is a hyperlink and, when clicked, will open a window to check/uncheck the check mark. This feature can be used for instance to mark an event as "complete" or "done". Events with a check mark will show up in the To Do list, which - when enabled by the administrator - can be selected from the calendar's navigation bar. On the admin's Categories page, when adding/editing an event category, if you select "Events need approval", users with post rights can - in this category - create events which are not visible to other users until a user with at least "manager" rights has approved the event. Until the event has been approved, no other user will see the event and both the originator and users with manager rights will see the proposed event in the various views displayed with a red bar on the left side. Once a user with "manager" rights has approved the event, the event will become visible to all users and the event will be locked and cannot be edited anymore by the originator. A user with at least manager rights can still edit the event. Of course, if you don't like the words "proposing" and "approving", you could for example also consider the words "booking" and "confirming".